Do you shop at JCPenny? If you do you could save yourself 25% right now. 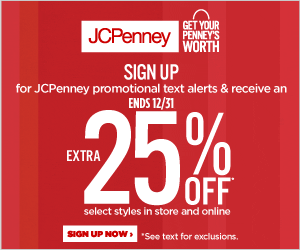 Sign-Up for JCPenney promotional text alerts and receive an extra 25% off select styles in-store and online. Ends 12/31. Take advantage of some of their holiday savings and add a bonus 25% off. This will help to make Christmas shopping a little bit easier.